Using the same method of surveying as mentioned above I undertook a survey of a 180 metre length of the hedge running along the side of Chambersbury Lane. The Lane itself was already known to date back to medieval times, so it was reasonable to assume that the hedge did so as well. Indeed the very mature Oak trees to be found every 30 metres or so along the length of the remaining hedge instantly make the hedge an old one. The tree immediately opposite the entrance into the Northend Estate being a particularly venerable one. If at all possible I would very much like to have a dendrochronologist date the tree from a thin core sample and so get an accurate dating. Fortunately this particular hedge has been less susceptible to cutting back and slight detours in the route of the lane than the hedge along the Hemel Hempstead Road. For many metres further than the 180 metre length surveyed, the hedge shows real signs of maturity, being tall and dense, and in many places over 6 foot deep. Hazel can be found in patches all along its length, which is also an indicator of a very ancient hedge. In fact all along its length the various species are well intermingled, again showing a hedge that has had centuries to develop, with new species taking a hold. Again, as with the previous survey, I discounted the presence of Bramble, Ivy and Honeysuckle as they didn't appear on the worksheet, although they were all plentiful. 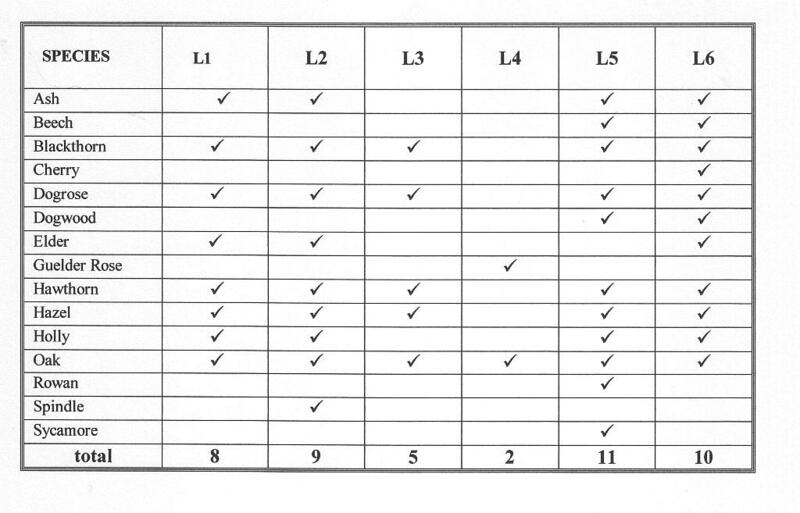 As the table shows, the average number of species found along the length of the survey was 10.83, dating the hedge to approximately 911 AD In fact in only one of the 30 metre lengths was there fewer than 10 species to be found, so that there is no doubt in my mind that the hedge is well over a thousand years old. N.B. Occasionally we could not be certain we had named the right species - however if we found the same type again we were consistent with our naming of the species, so that even if we have made an error over naming a species the total number of species in the hedge is accurate. We were, however, quite sure of the differences between Midland Hawthorn and the common Hawthorn - there were even what appeared to be hybrids, though we did not count these separately; also of the differences between Sycamore and Field Maple - the latter being generally smaller, a richer green and most distinctively, having a very much smoother outer edge to the leaf. The standard formula for measuring the date of a hedge is to count the number of woody species (trees and shrubs) contained in a 30m stretch, and length of hedge permitting, take the average number of woody species measured over 6 x 30m stretches, and multiply your answer by 100, thus arriving at the approximate age of the established hedge. However, a certain amount of caution has to be exercised over the result as various factors can, or have in the past, influence the species contained in the hedge. It is actually more relevant to look at old documents and maps first to decide if enclosure took place either by Act of Parliament or in a piecemeal fashion over a lengthy period of time - often beginning in late Saxon and Norman times and continuing through to Tudor times. However, where documentary and cartographic evidence supports the idea of early enclosure, dating a hedge can indicate valuable evidence of the survival of features from this very early landscape - features which can otherwise be taken for granted. 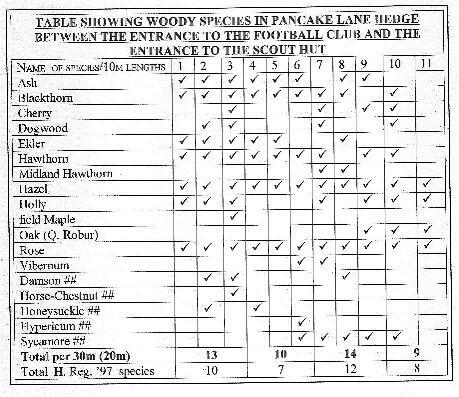 If you average out the number of species in each 30m length measured as shown in the above table it gives an average of 11.75 species, making the hedge approx. 1,175 years old. i.e. it could date from the 8th century. Even if the more ornamental and relatively recently introduced species are disregarded, it still places the hedge early medieval times. (Using the same formula but omitting those species not included in the 1997 Hedgerow regulations gives a date of 1070 AD to the hedge.) In addition, the continual presence of hazel is a sure indicator of an ancient hedge. The manor of Westwick was known to exist in pre-Norman times as the manor was willed to Queen Aelfgifu in about 942, and was gifted to St. Albans Abbey in 996. Saxon hedges of this date though not common, are far from unknown. Indeed the Hey part of the local place names Eastbrook Hey and Westbrook Hey is a Saxon word referring to a hedge, and is usually taken to mean "enclosed by a hedge." Indeed in the 7th century laws were passed stating that it was the responsibility of the farmer to ensure that the hedge or fence around his fields was stock proof, and that if any stock got in and damaged his crops no compensation would be paid. This particular stretch of hedge which runs along the LGFC grounds also contained bluebells and primrose in spring, and is not apparently maintained in any way at present - being tall and overgrown and containing several standard or near standard trees. The two Oaks at the end of the stretch are huge mature trees spaced about 20m apart. (Possibly 22 yards?! ), and suggestive of the medieval practice of planting an oak tree in a hawthorn hedge every 22 yards at the end of the old strips into which the village's field's were divided. to the Scout Hut and Westwick Row. Surveyed by Debbie Davy and Barbara Chapman, 4/7/97. The Scout Hut has a wide concrete entrance gate so there is a considerable gap of about 15m or more before the hedge - this time a definitely maintained hedge - is resumed the other side. Old documents tell us that Twitchy Lane (or Twitchel Lane), that is Pancake Lane, was a route way/path/lane long before 1569. A sketch map in a document dated 1696 suggests the lane was relatively straight, though as the map is extremely sketchy this cannot be certain. The Dury & Andrews map of 1766 shows Twitchy Lane as being straight, with the field with hedges on either side of the Lane. At the Westwick Row end of the lane it shows a small wooded area, approximating to the area of the Scout Hut and the field belonging to Westwick Farm. By the Gorhambury estate map of 1768 - a large scale map - it shows Twitchy Lane to be diverted at the top end of the Lane towards Westwick Farm, emerging into Westwick Row further along towards Green Lane. Comparison of the Tithe map, the 1877 1st Edition OS 25":1mile map, and the present 1:5000 O.S. map shows that the present football club occupies field 251 on the Tythe map and field no. 362 on the 1877 map. It is therefore clear that the diverted lane veered off Twitchy Lane where the present day entrance to the Scout Hut is situated. The 1877 shows that the final stretch of Twitchy Lane now resumed it's original course. Field 358 in the 1877 map (between Westwick Farmhouse and Pancake /Twitchy Lane) was partially wooded - a remnant no doubt of the wood shown to be there in 1766 - but that the corner triangular piece was free of large standing trees. 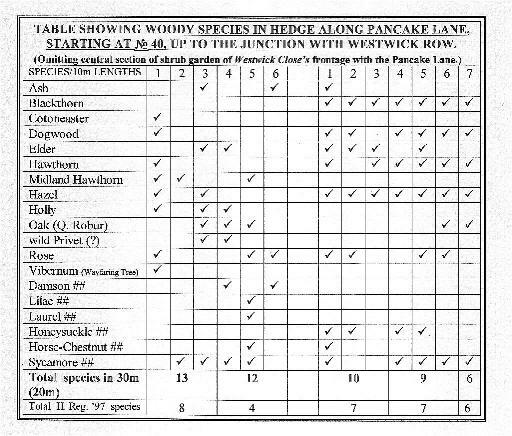 It seems possible to me that a farmer who farmed the land between 1768 and 1877 cleared that area of wood for whatever reason, and replanted the hedge along that stretch of what is now Pancake Lane with Hawthorn, and Sycamore; although the other species which we also found in the hedge were probably accounted for in part from nearby gardens, and from other specimens still remaining in nearby hedges or even lying dormant in the ground, and which have since been allowed to get a small foothold in the hedge. Therefore the considerably smaller number of species found in the hedge on that side of the road between the Scout Hut and the junction with Westwick Row can be accounted for. As can be seen from the table, the average number of species over the first 3 lengths of 30m is 6.33 Therefore the minimum age of the hedge is (100 x 6.33), which is 633 years. Therefore a hedge has been in existence on that site since at last 1365 AD. If surveyed from the Westwick Row end of the hedge first, then the average number of species is 6.66, making the hedge 666 years old! A difference of 33 years, a mere nothing in comparison to the whole. Using the species contained in the Hedgerow Regulations 1997 only, the hedge would appear to be 500 years old. However, as can be seen from the list, the predominant species are Hawthorn Elder and Sycamore. Other species occur only once or twice in the measured section of hedge. This fact, coupled with the fact that we know the Lane to have been diverted, and land use on either side of the lane to have undergone a change, leads me to suppose that the hedge was replanted during this period, especially as sycamore was planted in hedgerows during the 18th century to make them more attractive. The date arrived at is not necessarily invalid, but needs treating with caution. Elder is highly invasive and can take hold quickly; and because the line of the hedge was known to be the edge of a wood at one stage, and had on documentary evidence been in existence along the lane's boundary prior to that, conditions were probably rife to allow the development of other occasional seedlings, especially as their species are to be found in hedgerows and gardens nearby. around the arched entrance to Westwick Close. Undertaken by Debby Davy and Barbara Chapman 5/7/97. First of all, although we set out to survey all the hedges along Pancake lane between No. 40 and the junction with Westwick Row, we found that the central section around the arched entrance to Westwick Close, and the remaining "garden shrubbery" forming the boundary between the sweeping driveway of Westwick Close and Pancake Lane, contained so many introduced and ornamental species that it was obvious the area had been additionally planted at the time of Westwick Close's development in the early 1930's. The first part of this "shrub garden" had, however corresponded in part with the end of Pancake Wood furthest away from the Hemel Hempstead Road. (Pancake Wood only came into existence between 1840 and 1877 - prior to that it was arable land. We therefore decide it was best not to include this section in our calculations, and consequently omitted a considerable stretch of the Lane, resuming at the point immediately beyond the first entrance to Westwick Row. Secondly, other driveways were let into the line of the hedgerow in addition to that of the central section, (in particular the second 10m section was virtually entirely made up of the driveway into Westwick Close) thus affecting the species count in several cases. Nevertheless the average of the 4 full sections of 30m to be surveyed is 11 species giving an approximate date of 897 AD to the hedge. On the other hand, if just those species within the Hedgerow regulations 1997 are counted, the date for the hedge works out at 1172 AD. Because of the various developments which have taken place in Pancake Lane over the years I feel that it would not be reasonable to regard the various dates arrived at as if engraved in stone, but instead they should be regarded with caution, and not so much treated as absolute dates, but as a general indication that what is left of the original hedgerows along Twitchy Lane are of a great age and almost certainly were established by early medieval times, and possibly during Saxon times. The extensive work undertaken by Jonathan Hun has shown that "the field systems in the St. Albans area [in medieval times] were characterized by open common arable fields interspersed with smaller units sometimes enclosed with hedges." 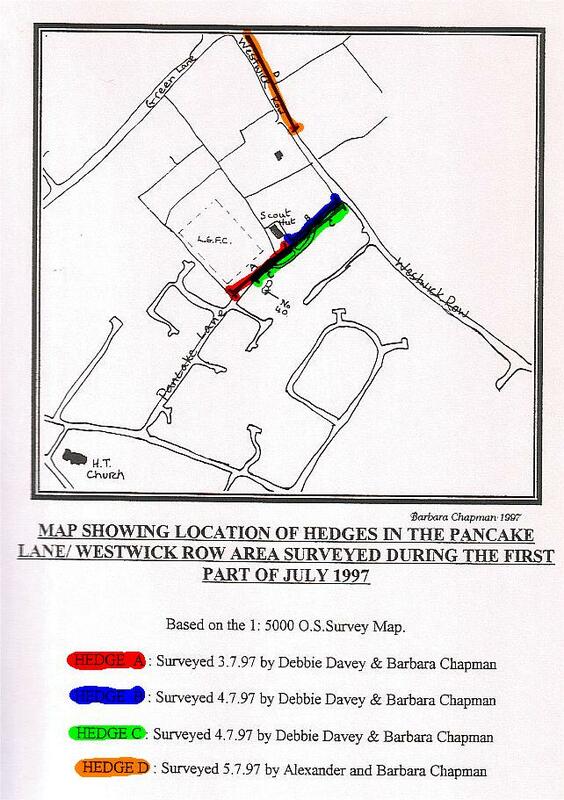 Postscript 1999: Sadly the part of the hedge which formed the starting point for this survey at No 40 Pancake Lane, was ripped out to provide parking space by the new owners after Debbie Davy and her husband sold up and moved to Hitchin. from it's junction with Green Lane for 180m. Undertaken by Alex and Barbara Chapman 7/7/97. Using the same formula as previously to work out the approximate date of the hedge, i.e. averaging the total number of woody species found in the six /thirty meter lengths of hedge, the table above gives us a date of 1281 AD. Again, if the same formula is used, but this time only using those species contained in the 1997 Hedgerow Regulations, a date of 1381 AD is obtained, a mere century later. It can therefore be very clearly seen that this hedge dates very definitely from the early middle ages. Although as yet no other 180m stretches of hedge along Westwick Row have been accurately surveyed, a stroll along the Row reveals a very similar pattern of hedge species in those stretches unaffected by garden frontages to existing properties. It is not unreasonable therefore to assume that if the hedge existed along the side of Westwick Row by the end of the 14th century at the latest, then the thoroughfare itself is probably older still. This is further born out by the fact that during the fourteenth century after the Black Death, the shortage of manpower led to the breakup of many of the large common fields established by the Normans as part of the feudal system. The peasants became more prosperous and were able to purchase their own strips of land, frequently planting hedges around them to declare ownership. Yet further evidence supports the date of this hedge in the fact that along this stretch of Westwick Row, as well as other places along this road, the hedgerows on either side of the road are some distance from the main thoroughfare, and in several instances the hedge and surrounding land is higher than the level of the road. This tended to come about during the middle ages, firstly because in a pre-Macadam age people tended to vary where they walked, thus over time creating a wide thoroughfare. With the coming of the industrial revolution and the eventual surfacing of these old routes, only the central section was covered. In addition in this part of Hertfordshire, wide stretches of green verge on either side of a roadway are common and provided the common grazing which was otherwise missing. Secondly, the level of the road was gradually warn down, and it was also common practice for farmers to pile up the stones they ploughed up in the hedgerow itself, thus causing the bank of the hedge to get bigger and bigger. Current large scale O.S. maps of the area. Other sources relating to the area consulted in the compilation of "The Leverstock Green Chronicle". from the Hertfordshire & Middlesex Wildlife Trust. "The two larger fields north west of Bunkers Lane are separated by narrow, mixed woodland shelter-belt, probably dating from around the mid-to-late 19th century. Hedgerows from an important wildlife feature of the site. Remnants of former field boundary hedges are still to be seen in the centre of the site, but the thick mature hedge along Bunkers Lane, recently dated to the medieval period, provides the main interest. Back in the 1970's, hedges along Chambersbury Lane, which forms the site boundary on the NW side, and which separates the rural from the urban landscape, were given a similar dating. These hedges have suffered in more recent times from road widening and building activities." 2017 - OFFICIAL INFORMATION AND REGULATIONS REGARDING ANCIENT HEDGEROWS AND DATING. When I undertook the original surveys, hedgerow dating was only just being recognised as a valuable tool when assessing a landscape. 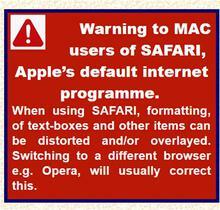 Fairly soon afterwards the first government guidelines appeared, and since then its now carefully regulated. Although basically the same as when we undertook the surveys in 1995/1997 there have been certain tweaks, so anyone undertaking a survey today, especially if wishing to use it legally e.g. in a planning response, should make sure they obtain the government booklet and use their specific methodology. Using the system for dating hedges devised by Professor Max Hooper in the 1960's, and given in various textbooks including "The Living History of Our Hedgerows" , and "The Local Historian's Encyclopaedia" [S93], I have undertaken a survey of the hedge along the northern side of the Hemel Hempstead Road, going out of Leverstock Green towards St. Albans; and of the hedge along Chambersbury Lane, starting at the footpath to Bunkers Farm. The basic formula for dating a hedge is: THERE IS A NEW SPECIES IN A HEDGE EVERY HUNDRED YEARS MEASURED OVER A 30 METRE LENGTH. Therefore if the average number of woody species found per 30 metres is six, then the hedge is at least 600 years old. The survey started just past the electricity substation, and continued up the road for six lengths of 30 metres. This brought the surveyor to nearly the end of the lay-by. As I had previously suspected, the survey showed that the original hedge is very old indeed, making the likelihood of the road or trackway itself, equally old. From estate maps in the Gorhambury Collection, I already knew beyond doubt that the Hemel Hempstead Road existed in 1696 (and was called that), and other old maps going back a further century showed the apparent line of the road, but the evidence from the hedge makes it seem likely that the road or trackway was in existence in Saxon times, as the hedge, and therefore the field boundary, certainly was. The table (click on thumnail above right) shows the lengths walked and the species found. 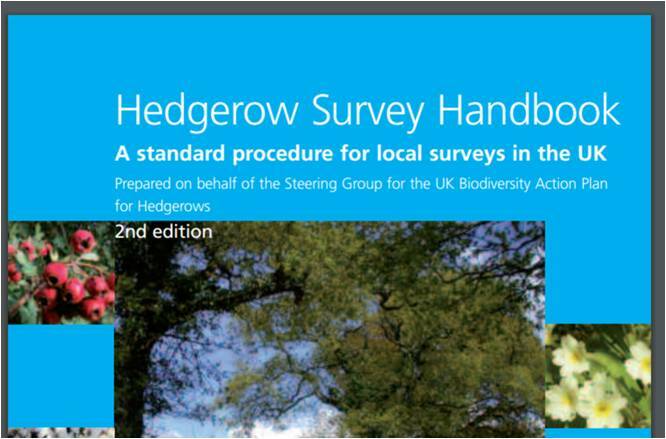 I have only included those species found in the length of the hedge, although altogether the worksheet used on the survey contained 26 different species for use when dating a hedge. As the worksheet I was basing the survey on did not include Honeysuckle and Bramble and Bindweed, although all three species were present for much of the length of the hedge, I have not included them in the table and my calculations. The sixty metre length of hedge in the centre of the survey was of a very different character, and the relatively large number of species shown in length 3, all occurred in the first few metres of that section. Instead the majority of the hedge in that section - where it existed - was bramble; several sections were of wire stretched between fairly old fence-posts. It was obvious that this section of "hedge" was relatively new, and if you took a sighting between the start of the hedge near the electricity substation, and the end of the section in the lay-by, it became apparent that at some stage the course of the road had been altered, and the original hedge removed for a section, allowing the field to be slightly enlarged, and a lay-by to be created. In addition to this, the overgrowth of nettles, brambles and the like in the first 60 metres of the hedge, made it impossible for me to get really close in to the hedge. Had I been able to do so I may well have found some other species growing closer in the hedge as I did up near to the lay-by section, where Sycamore and Beech could only be found on very close inspection. 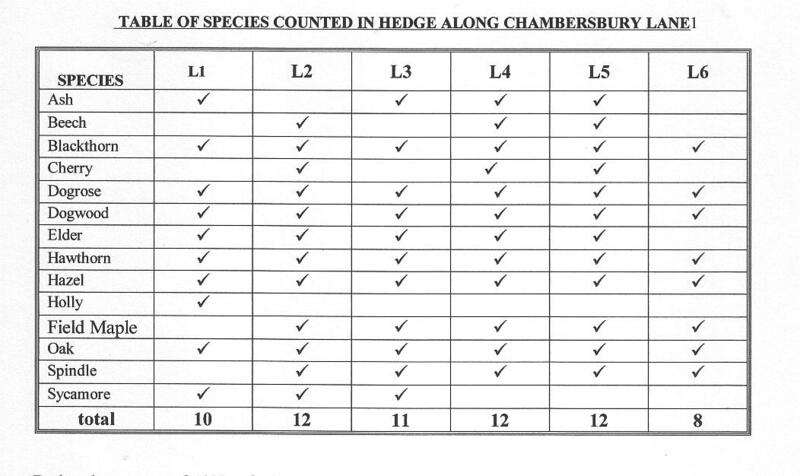 Ideally I would like to re-survey the length of the hedge with stout gloves and protective clothing so that nothing could possibly be overlooked..
As can be seen from the figures, if you discount sections 3 & 4, the average number of species in the hedge is 9.5. This dates the hedge to beginning of the eleventh century, before the Norman Conquest. If, on the other hand the true number of species should be 10 or 11 as shown in the section up by the lay-by, then the hedge can be dated further back into the Saxon era. This is doubly reinforced by the presence of Hazel along its length, an indicator of a hedge of ancient pedigree. I was not surprised to find the hedge was so old as we know the area was part of the Westwick/Gorhambury estate as early as Roman times, and I feel sure extra species would be found if a closer inspection of the hedge could be made. Also it always seemed logical to me that a trackway would have developed along the this route very early on the principle of the shortest distance being a straight line - in this instance between St. Albans and the known existing Roman Route leading through High Street Green directly to the Town of Hemel. Hedgerows made up of a line of trees and shrubs in the countryside are protected by law from being removed or worked on without control. You could be fined up to £5,000 if you break the rules for removing certain hedgerows. If you’re formally charged you could get an unlimited fine (under the Hedgerows Regulations 1997).